Posted On : 02 October 2018 | Author : Data Plus Value Team | Tag : Professional Magento Data Entry Companies, Product Data Entry Outsourcing, Upload Product in Magento Store. E-commerce market is ever progressing and to maintain stability, most businesses prefer to outsource product data entry needs to professional companies. Magento is considered as one of the leading shopping cart software on the internet on which any online vendor can depend completely. This is user-friendly software with rich features but in order to make the best use of features, it offers, getting an expert Magento data entry service provider is necessary. Some of the major advantages of outsourcing are mentioned below. To manage your product inventory along with order processing and continuous customer support is a complex task. Most of the time businesses fail to manage all such tasks by themselves mainly due to the shortage of time as well as resources. This can create uncomfortable customers due to the delays or lack of perfection from your side. However, by outsourcing, you can distribute more staffs to main business processes and this can increase your productivity. Professional outsourcing companies employ skilled as well as the experienced workforce. You can thus get your work performed by expert people who can work with the best ways to provide you with optimum results. 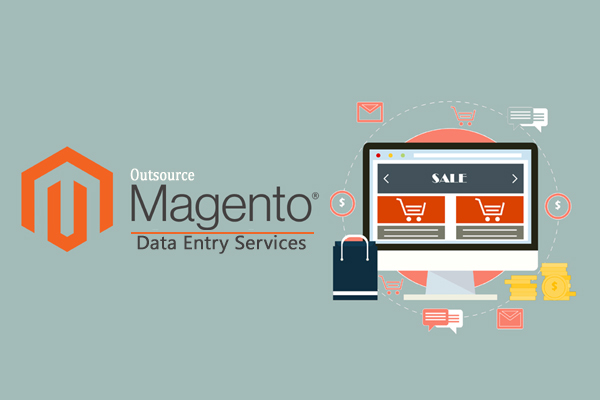 They know most aspects related to magento data entry including image enhancements, SEO improvements, online chat support as well as order processing etc. On the other hand, if you employ staffs for your office, you may have to spend effort and time in getting them known to the project. The costing also becomes higher. The time you spend on non-core activities is a big loss. It removes your attention from the main areas on which you need to focus more. This hampers your business growth and you are unable to entertain the customers. Also when your business increases, the non-core activities also increase which makes things more complicated. So, getting a professional team is always suitable. Since most outsourcing companies have in-house staff and all required infrastructure, they charge reasonably. Also, you would not have any liabilities that you face while hiring a permanent staff for your office. Along with this, there are various options when it is related to the service provisions for Magento shopping cart management. Almost most companies even offer special customized solutions related to your precise requirements. Thus you will get the maximum value for your money.